If you are old enough, you may recall a song that was quite popular among evangelicals decades ago, “I Have Decided to Follow Jesus.” In one of its verses, the worshipper sings, “The Cross before me, the world behind me…no turning back.” It is a powerful song of consecration. It reminds us to take our eyes off of the world and self and focus them on the Cross on which Jesus died. Now, the truth is, the Cross upon which we are to keep our eyes is actually behind us. That’s right! Jesus was slain before the foundation of the world. It was nearly two-thousand years ago that Jesus was crucified on a hill, far away. the Cross is where sin’s power is broken and sins are forgiven; where Law ends and Grace begins; where the curse ceases and blessings commence; where demands give way to supply! The Cross is where God overcomes every problem for us and meets all our needs. Think about this for a moment. If the Cross is where God overcomes every problem and meets every need for you, and the Cross is behind you, then sin and judgment, sickness and poverty, fear and failure are behind you. Permanently! 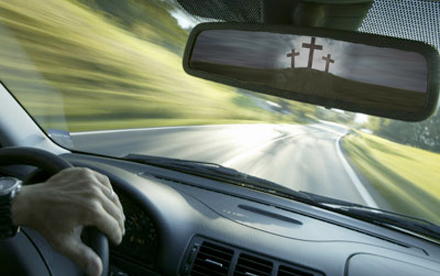 So today, when you look at the Cross, it should be like looking in the rear view mirror of a rapidly moving vehicle and seeing, not what is coming your way, but all those curses left behind…on a hill, far away! Child of God, if Jesus overcame every curse for you at the Cross, then it is not your job to overcome them. Your part is simply to believe in and rest upon His finished work. Just keep acknowledging every good thing you have in Jesus. And as you do so, His blessings will manifest and overtake you in every arena of your life. The curse has been left behind. Thank God soooooooo much for JESUS and if believing in Him is a crime, then, I am a criminal.